For other uses, see Cortana (disambiguation). Cortana can set reminders, recognize natural voice without the requirement for keyboard input, and answer questions using information from the Bing search engine. Cortana was demonstrated for the first time at the Microsoft BUILD Developer Conference (April 2–4, 2014) in San Francisco. It has been launched as a key ingredient of Microsoft's planned "makeover" of the future operating systems for Windows Phone and Windows. The development of Cortana started in 2009 in the Microsoft Speech products team with general manager Zig Serafin and Chief Scientist Larry Heck. Heck and Serafin established the vision, mission, and long-range plan for Microsoft's digital-personal-assistant and they built a team with the expertise to create the initial prototypes for Cortana. To develop the Cortana digital assistant, the team interviewed human personal assistants. These interviews inspired a number of unique features in Cortana, including the assistant's "notebook" feature. Originally Cortana was only meant to be a codename, but a petition on Windows Phone's UserVoice site that proved to be popular made the codename official. On May 26, 2015, Microsoft announced that Cortana would also be available on other mobile platforms. An Android release was set for July 2015, but an Android APK file containing Cortana was leaked ahead of its release. It was officially released, along with an iOS version, in December 2015. During E3 2015, Microsoft announced that Cortana would come to the Xbox One as part of a universally designed Windows 10 update for the console. Microsoft has integrated Cortana into numerous products such as Microsoft Edge, the browser bundled with Windows 10. Microsoft's Cortana assistant is deeply integrated into its Edge browser. Cortana can find opening-hours when on restaurant sites, show retail coupons for websites, or show weather information in the address bar. At the Worldwide Partners Conference 2015 Microsoft demonstrated Cortana integration with upcoming products such as GigJam. Conversely, Microsoft announced in late April 2016 that it would block anything other than Bing and Edge from being used to complete Cortana searches, again raising questions of anticompetitive behavior by the company. Microsoft's "Windows in the car" concept includes Cortana. The concept makes it possible for drivers to make restaurant reservations and see places before they go there. At Microsoft Build 2016, Microsoft announced plans to integrate Cortana into Skype (Microsoft's instant messaging service) as a bot to allow users to order food, book trips, transcribe video messages and make calendar appointments through Cortana and in addition to other bots. As of 2016[update], Cortana can underline certain words and phrases in Skype conversations that relate to contacts and corporations. A writer from Engadget has criticised the Cortana integration in Skype for only responding to very specific keywords, feeling as if she was "chatting with a search engine" due to the impersonal way the bots replied to certain words such as "Hello" the Bing Music bot brought up Adele's song of that name. In December 2016, Microsoft announced the preview of Calendar.help, a service that enabled people to delegate the scheduling of meetings to Cortana. Users interact with Cortana by including her in email conversations. Cortana would then check people's availability in Outlook Calendar or Google Calendar, and work with others Cc'd on the email to schedule the meeting. The service relied on automation and human-based computation. In May 2017, Microsoft in collaboration with Harman Kardon announced INVOKE, a voice-activated speaker featuring Cortana. The premium speaker has a cylindrical design and offers 360 degree sound, the ability to make and receive calls with Skype, and all of the other features currently available with Cortana. Cortana can set reminders, recognize natural voice without the requirement for keyboard input, and answer questions using information from the Bing search engine (e.g., current weather and traffic conditions, sports scores, biographies). Searches using Windows 10 will only be made with Microsoft Bing search engine and all links will open with Microsoft Edge, except when a screen reader such as Narrator is being used, where the links will open in Internet Explorer. Windows Phone 8.1's universal Bing SmartSearch features are incorporated into Cortana, which replaces the previous Bing Search app which was activated when a user presses the "Search" button on their device. Cortana includes a music recognition service. Cortana can simulate rolling dice and flipping a coin. 'Cortana's "Concert Watch" monitors Bing searches to determine which bands or musicians the user is interested in. It integrates with the Microsoft Band watch band for Windows Phone devices if connected via Bluetooth, it can make reminders and phone notifications. Since the Lumia Denim mobile phone series, launched in October 2014, active listening was added to Cortana, enabling it to be invoked with the phrase: "Hey Cortana"; it can then be controlled as usual. Some devices from the United Kingdom by O2 have received the Lumia Denim update without the feature but this was later clarified as a bug and Microsoft has since fixed it. Cortana integrates with services such as Foursquare to provide restaurant and local attraction recommendations and LIFX to control smart light bulbs. Cortana stores personal information such as interests, location data, reminders, and contacts in the "Notebook". It can draw upon and add to this data to learn a user's specific patterns and behaviors. Users can view and specify what information is collected to allow some control over privacy, said to be "a level of control that goes beyond comparable assistants". Users can delete information from the "Notebook". Cortana has a built in system of reminders which for example can be associated with a specific contact; it will then remind the user when in communication with that contact, possibly at a specific time or when the phone is in a specific location. Originally these reminders were specific to the device Cortana was installed on, but since Windows 10 Microsoft synchronizes reminders across devices. 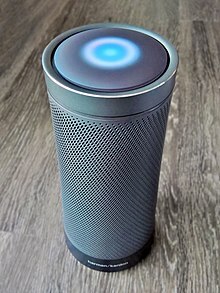 Most versions of Cortana take the form of two nested, animated circles which are animated to indicate activities such as searching or talking. The main color scheme includes a black or white background and shades of blue for the respective circles. Cortana on Windows mobile and Android is capable of capturing device notifications and sending them to a Windows 10 device. This allows a computer user to view notifications from their phone in the Windows 10 Action Center. The feature was announced in early 2016 and released later in the year. Cortana has a "do-not-disturb" mode in which users can specify "quiet hours", as was available for Windows Phone 8.1 users. Users can change the settings so that Cortana calls users by their names or nicknames. It also has a library of "Easter Eggs", pre-determined remarks. When asked for a prediction, Cortana correctly predicted the winners of the first 14 matches of the football 2014 FIFA World Cup knockout stage, including the semi-finals, before it incorrectly picked Brazil over the Netherlands in the third place play-off match; this streak topped Paul the Octopus who correctly predicted all 7 of Germany's 2010 FIFA World Cup matches as well as the Final. Cortana can forecast results in various other sports such as the NBA, the NFL, the Super Bowl, the ICC Cricket World Cup and various European football leagues. Cortana can solve mathematical equations, convert units of measurement, and determine the exchange rates between currencies including Bitcoin. Cortana can integrate with third-party apps on Windows 10 or directly through the service. Starting in late 2016, Cortana integrated with Microsoft's Wunderlist service, allowing Cortana to add and act on reminders. At Microsoft's Build 2017 conference, Microsoft announced that Cortana would get consumer third-party skills capability, similar to that in Amazon Alexa. On Feb 16, 2018 Microsoft announced connected home skills were added for ecobee, Honeywell Lyric, Honeywell Total Connect Comfort, LIFX, TP-Link Kasa, and Geeni. As well as support for IFTTT was also added. On August 15, 2018, Cortana-Alexa integration went into public preview. At Microsoft's Ignite 2018 conference, Microsoft announced an Technology Adopters Program that Enterprises could build skills that could be developed and deployed into Azure tenants, accessible by organizational units or security groups. Presently third-party skills are only available in the US and in US English. Cortana indexes and stores user information. It can be disabled; this will cause Windows search to search the Web as well as the local computer, but this can be turned off. Turning Cortana off does not in itself delete user data stored on Microsoft's servers, but it can be deleted by user action. Microsoft has further been criticized for requests to Bing's website for a file called "threshold.appcache" which contains Cortana's information through searches made through the Start Menu even when Cortana is disabled on Windows 10. As of April 2014[update], Cortana was disabled for users aged under 13 years. The UK version of Cortana speaks with a British accent and uses British idioms, while the Chinese version, known as Xiao Na, speaks Mandarin Chinese and has an icon featuring a face and two eyes, which is not used in other regions. As of 2016[update] the English version of Cortana on Windows devices is available to all users in the United States (American English), Canada (French/English), Australia, New Zealand, India, and the United Kingdom (British English). Other language versions of Cortana are available in France (French), China (Simplified Chinese), Japan (Japanese), Germany (German), Italy (Italian), Brazil (Portuguese), Mexico, and Spain (Spanish). Cortana for Android and iOS is also available in the same languages. Even though Cortana listens generally to the hot word "Hey Cortana", certain languages use customized versions (e.g. "Hola Cortana" for Spanish). The United Kingdom (English) localised version of Cortana is voiced by Ginnie Watson, an Anglo-French actress, singer/songwriter and voice-over artist. The United States (English) localised version of Cortana is voiced by Jen Taylor, the voice actress who voices Cortana, the namesake of the virtual assistant, in the Halo video game series. This table identifies the localized version of Cortana currently available. Except where indicated, this applies to both Windows Mobile and Windows 10 versions of the assistant. The natural language processing capabilities of Cortana are derived from Tellme Networks (bought by Microsoft in 2007) and are coupled with a Semantic search database called Satori. Cortana updates are delivered independently of those to the main Windows Phone OS, allowing Microsoft to provide new features at a faster pace. Not all Cortana-related features can be updated in this manner as some features such as "Hey Cortana" require the Windows Phone update service and the Qualcomm Snapdragon SensorCore Technology. ^ Microsoft Corporation. "Cortana". Play Store. Google. Retrieved September 29, 2017. ^ Microsoft Corporation. "Cortana". App Store. Apple. Retrieved September 29, 2017. ^ "Cortana – Digital assistant". APKMirror. Retrieved September 29, 2017. ^ Risley, James (March 30, 2016). "Microsoft introduces Cortana-powered chatbot for Skype, opening up framework to developers". Geek Wire. ^ Callaham, John (December 9, 2015). "Microsoft's Cortana digital assistant officially launches on Android and iPhone". Windows Central. Retrieved December 9, 2015. ^ a b Shuman, Andrew (August 30, 2017). "Hey Cortana, open Alexa: Microsoft and Amazon's first-of-its-kind collaboration". Microsoft Blogs. Retrieved August 30, 2017. ^ a b Foley, Mary Jo (March 4, 2014). "Microsoft's 'Cortana' alternative to Siri makes a video debut". ZDNet. ^ "Cortana's regions and languages". Microsoft. Retrieved September 18, 2016. ^ Julianne Pepitone. "Why Microsoft Named Its Siri Rival 'Cortana' After a 'Halo' Character". NBC News. ^ "Marathon's Story... Facts and puzzling things about... Cortana". bungie.org. ^ Blair, Nancy (April 3, 2014). "Who is Cortana? It's Halo's Jen Taylor". USA Today. ^ Microsoft Research (April 17, 2014). "Anticipating More from Cortana". Microsoft Research blogs. Archived from the original on March 3, 2016. ^ "Cortana: a digital assistant with personality and smarts". community.windows.com. Retrieved November 16, 2018. ^ Sawers, Paul (May 26, 2015). "Microsoft announces Phone Companion app for Windows 10 and teases Cortana for Android and iOS". VentureBeat. ^ Hachman, Mark (May 5, 2015). "Microsoft's Edge web browser roadmap includes more Cortana scenarios, extensions". PC World. ^ Rama, Gladys (July 13, 2015). "Microsoft Debuts 'Project GigJam' at WPC 2015". PC Magazine. ^ "Microsoft locks down Cortana: Blocks integration with other browsers, search engines". ^ Warren, Tom (September 16, 2015). "Microsoft experimenting with Cortana in your car". The Verge. It's clear that Microsoft's car efforts have progressed over the past year, but the company still isn't ready to launch its own Windows 10 integration. ^ Hernandez, Pedro (March 31, 2016). "Microsoft Previews a Smarter Skype With Bots, Cortana Integration". eWeek. ^ de Looper, Christian (March 30, 2016). "Skype now has the smarts to book your trip, order pizza, and more with Cortana". Yahoo! Finance. ^ Lee, Nicole (March 30, 2016). "Chatting with Skype bots feels like talking to a search engine". Engadget (AOL). ^ Surur, Suril (April 2, 2016). "Cortana is now 2 years old". MSPowerUser. ^ Torres, JC (April 1, 2016). "Cloud-based Windows 10 Action Center will also be on Android". SlashGear. ^ Chavez, Chris (April 1, 2016). "Windows 10 Anniversary Update not only mirrors Android notifications, but lets you interact with them too [VIDEO]". Phandroid. ^ Amadeo, Ron (April 2, 2016). "The Windows 10 Anniversary Update can mirror Android notifications. Get Android notifications on your desktop. The catch: You have to install Cortana". Ars Technica. ^ "Enroll in the Calendar.help preview and let Cortana schedule your meetings - Office Blogs". Office Blogs. December 13, 2016. Retrieved April 1, 2018. ^ "How We Built a Virtual Scheduling Assistant at Microsoft". Harvard Business Review. July 28, 2017. Retrieved April 1, 2018. ^ Cranshaw, Justin; Elwany, Emad; Newman, Todd; Kocielnik, Rafal; Yu, Bowen; Soni, Sandeep; Teevan, Jaime; Monroy-Hernández, Andrés (May 2, 2017). Calendar.help: Designing a Workflow-Based Scheduling Agent with Humans in the Loop. ACM. pp. 2382–2393. doi:10.1145/3025453.3025780. ISBN 9781450346559. ^ Sams, Brad (May 7, 2017). "Harman Kardon's Cortana Speaker Revealed". Thurrott. BWW Media Group. Retrieved May 8, 2017. ^ Microsoft. "My interests and Cortana". Windows Phone. Archived from the original on July 7, 2014. Retrieved June 19, 2014. ^ Microsoft. "Remind me, Cortana". Archived from the original on July 7, 2014. Retrieved June 19, 2014. ^ Warren, Tom (April 2, 2014). "The story of Cortana, Microsoft's Siri killer". The Verge. Retrieved June 19, 2014. ^ "Microsoft limits the Cortana search box in Windows 10 to Bing and Edge only". ^ Edmonds, Rich (February 11, 2014). "Developers leak Windows Phone 8.1 SDK, reveal new features". Windows Phone Central. Retrieved June 19, 2014. ^ Burgess, Brian (April 19, 2014). "Use Cortana on Windows Phone 8.1 to Identify Songs". GroovyPost. ^ none, Ron (October 30, 2014). "Say hello to Microsoft Band, a $199 fitness band that keeps you fit and lets you check emails and texts too". WinBeta. ^ Crist, Ry (October 15, 2015). "The new Lifx Windows 10 app lets Cortana toggle your lights". CNET. ^ "Cortana now taps into Foursquare to give you recommendations for lunch". engadget.com. Retrieved October 8, 2016. ^ Hachman, Mark (February 21, 2014). "Microsoft's Cortana digital assistant guards user privacy with 'Notebook'". PCWorld. Retrieved June 16, 2014. ^ a b Warren, Tom (March 3, 2014). "This is Cortana, Microsoft's answer to Siri". The Verge. Retrieved June 16, 2014. ^ Guim, Mark (April 26, 2014). "How to set a person-based reminder with Cortana". Windows Central (Mobile Nations). ^ Sams, Brad (February 13, 2015). "Windows 10: Cortana now syncs reminders". Neowin. ^ Kleiman, Jacob (March 3, 2014). "Windows Phone Cortana Mobile Assistant Detailed in New Leak". TechnoBuffalo. Retrieved June 16, 2014. ^ kbridge. "Cortana design guidelines - Cortana UWP design and development". docs.microsoft.com. Retrieved May 4, 2017. ^ "Cortana Can Now Sync Notifications From Your Android Phone To Your Windows 10 PC - Thurrott.com". Thurrott.com. May 19, 2016. Retrieved May 10, 2017. ^ Sabri, Sam (April 15, 2014). "How to set up Quiet Hours and Inner Circles on Windows Phone 8.1". Windows Phone Central. Retrieved June 16, 2014. ^ Warren, Tom (April 15, 2014). "Clippy replaces Cortana in Windows Phone 8.1 Easter egg". The Verge. Retrieved June 16, 2014. ^ Kessler, Derek (April 15, 2014). "Cortana Easter Egg resurrects Clippy as your personal digital assistant". Windows Phone Central. Retrieved June 16, 2014. ^ "Cortana's unbroken streak ends with Netherlands 3:0 win over Brazil". WMPoweruser.com. July 12, 2014. Retrieved July 13, 2014. ^ Backaitis, Virginia (July 11, 2014). "Why Microsoft's Cortana is 14 for 14 Calling World Cup Matches". CMSWire.com. Retrieved July 13, 2014. ^ Akash KJ (July 10, 2014). "Germany Will Beat Argentina to Win FIFA World Cup 2014 Final Predicts Cortana". International Business Times. Archived from the original on July 10, 2014. Retrieved July 13, 2014. ^ Wint, Bradley (July 9, 2014). "Cortana maintains winning streak, correctly predicting 14 games in a row". KontentPort.com. Retrieved July 13, 2014. ^ Manfred, Tony (January 28, 2015). "The Microsoft Engine That Nailed The World Cup Is Predicting Every NFL Game – Here's Its Pick for the Super Bowl". Business Insider. ^ Curdie, Lewis (February 2, 2015). "Super Bowl winner correctly predicted by Windows Phone Cortana". Mobot. Retrieved February 3, 2015. ^ Allison, Michael (February 8, 2015). "Bing now predicts ICC Cricket World cup". WMPowerUser. ^ Sieber, Tina (January 28, 2015). "Here's how to make the most of Cortana, the Windows 10 digital assistant". Digital Trends. Retrieved January 29, 2015. ^ "Hey Cortana..." Wunderlist Blog. November 17, 2016. Retrieved May 10, 2017. ^ "Microsoft takes aim at Alexa with Cortana Skills Kit". Engadget. Retrieved May 10, 2017. ^ "Windows Blog". Windows Blog. ^ "Microsoft tries again to win developers with new Cortana Enterprise SKills Kit". ZDNet. Retrieved March 21, 2019. ^ "Cortana FAQ". Microsoft. Retrieved March 19, 2019. ^ Brad Chacos (July 30, 2015). "How to disable Cortana in Windows 10". Pcworld.com. Retrieved April 4, 2016. ^ Bright, Peter (August 13, 2015). "Even when told not to, Windows 10 just can't stop talking to Microsoft. It's no wonder that privacy activists are up in arms". Ars Technica UK. ^ Smith, Chris (August 13, 2015). "Windows 10 might be spying on you even after you tell it to stop". Boy Genius Report. ^ Nichols, Shaun (April 25, 2014). "Microsoft's naughty Cortana NOT ALLOWED NEAR CHILDREN". The Register. ^ "Windows Phone 8.1 Update brings Cortana to new markets + new features". Blogging Windows. ^ "Cortana's regions and languages". Microsoft. Retrieved October 8, 2016. ^ "¿Qué es Cortana?- Microsoft Support". support.microsoft.com. Retrieved May 4, 2017. ^ a b c "Cortana's regions and languages". Retrieved July 29, 2016. ^ Novet, Jordan (June 25, 2014). "Cortana will land in China and the United Kingdom in the coming weeks". Venturebeat News. ^ a b Duckett, Chris (November 13, 2015). "Hobbled Cortana arrives in Canada, Australia, Japan, and India. As part of the latest update to Windows 10, Microsoft's digital assistant has arrived in a number of new geographies". ZDNet. 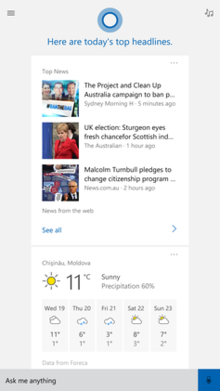 ^ "Microsoft's Cortana app adds support for Canada on iOS and Android". Onmsft. December 18, 2017. ^ "Windows 10 update: Cortana now understands Indian accent". The Indian Express. November 13, 2015. ^ Whitney, Lance (December 5, 2014). "Microsoft Cortana expands to French, Italian, German and Spanish". CNet. ^ Surur, Author (February 2, 2015). "Cortana's Italian improves". WMPowerUser. ^ Hernandez, Pedro (December 5, 2014). "Cortana Goes Globetrotting in European Alpha". eWeek. ^ Shanahan, Dave (March 4, 2016). "Cortana App for iOS now available in Japan". WinBeta. ^ Gary Marshall. "Cortana: everything you need to know about Microsoft's Siri rival". TechRadar. ^ Lee, Tyler (July 21, 2014). "Cortana Will Enable Itself Automatically, No Action Required". Ubergizmo. ^ Tofel, Kevin C. (December 18, 2014). "Lumia Denim update arrives, bringing Cortana and better pictures". Gigaom. This page was last edited on 23 April 2019, at 10:30 (UTC).